Ms. Konjit Kidane is a Senior Supply Chain Officer overseeing WFP Reginal Operation in Kenya, a position she has held since Sep 2013. 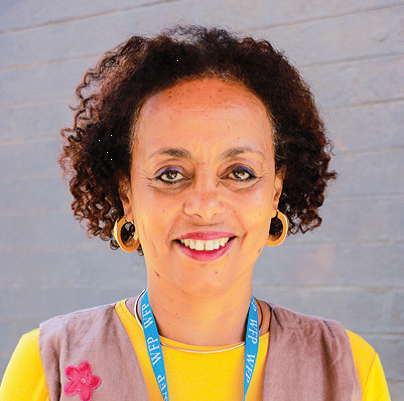 Ms. Kidane is an experienced logistician with a career spanning over 23 years in various WFP emergency operations in Iraq, Afghanistan and South Sudan and protracted relief and development programs in Ethiopia, Tanzania, Uganda, Sudan and currently Kenya. WFP Kenya Logistics Unit is responsible for the management of supply chain operations in Kenya, and overseeing one of the largest humanitarian reginal corridor, that support WFP program in Uganda, DRC, Rwanda, Burundi, South Sudan and Somalia. WFP Kenya Five-years Country Strategic Plan works hand in hand with the government to achieve SDG 2 ensure vulnerable population have access to food and SDG 17 national government capacity strengthened and knowledge shared for GOK to achieve their SDG goals. Ms. Konjit holds a Master of Business Administration in Project Management from Preston University and BSc degree in Mathematics from Addis Ababa University.